Sometimes, all you need to sell something is a basic premise. 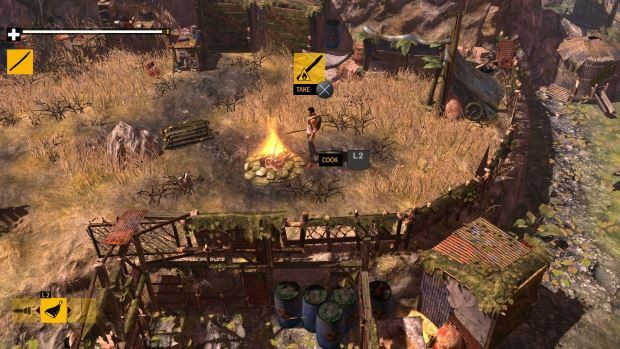 For example, just a piece of paper with the words “Dead Island meets Diablo” was enough to hook me right in to Eko Software’s new zombie-based survival RPG, How to Survive. While such comparisons might be a little generous, it’s fair to say that H2S deserves to hook you in. The concept is incredibly simple. You play one of three survivors washed up on the shore of a mysterious island overrun with zombies and mutants, and must find a way off. Ignoring the most glaring plot hole imaginable (you use boats to travel between the four islands in the chain, but for some reason can’t just sail away), it’s all you really need for a serviceable adventure game – but How to Survive is more than that. As made clear by the title, this is a game about survival rather than just killing zombies. You’ll have to make your own weapons and armour, find clean water to drink, hunt and cook meat, and harvest flora to stay fed. You need to sleep regularly, which means finding a safe bed. You’ll have to brave the wilds at night with only a flash-light or burning torch, and you’ll have to choose between what to carry in your limited backpack and what to drop to save space. 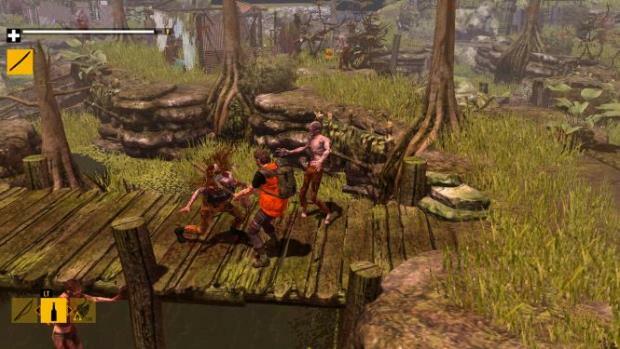 The Dead Island comparisons are obvious, but references to Diablo are mostly hyperbole. All H2S really shares with Blizzard’s lootathon is an XP system and an isometric perspective. The skill trees are comparatively shallow, and the combat – while enjoyable – is very basic. Each of the three characters have different physical traits: Abby is more athletic and recovers stamina quicker, Jack is bigger and more powerful but slow-moving, and Kenji has the highest base precision but is only average in all other respects. It’s not the deepest or most robust character roster, but each has a single unique skill on the shared tree that sets them apart: Jack can make scopes to improve his accuracy, Abby can make incendiary arrows and Kenji can craft a powerful crossbow. Beyond that, the skills you unlock upon gaining a level are all the same for each protagonist, and are all decidedly tame. Combat is taken care of with the X button (on 360), which delivers straightforward blows to the head that can stagger a zombie, before an A button prompt performs an instant kill (or you can set the instant kills to auto in Options). At first it’s laughably bare-bones, but as the enemy types increase and you find yourself constantly swamped by mobs of the undead and decaying wildlife, you’re almost thankful for it. You also have a ranged weapon that you’ll have to make, such as a longbow, handmade shotgun or triple-bladed boomerang, which you can aim with the right stick. When using a bow or gun, the white reticle will switch to red and zero in on a zombie’s head, meaning a single shot will put them down. It’s hugely satisfying with the bow – and you can retrieve your arrows afterwards, too. The islands are littered with trash from which you can make all kinds of tools. For instance, find a bike chain, a motor and an oil can, hammer them together with some hardware, and you’ve got a makeshift chainsaw. Slice up old sticks and top them with feathers from hunted birds to create accurate, piercing arrows. Plants can be mixed with bits of cloth to create poultices and the rare, exotic flowers can be combined to make drinks that increase your strength or reduce damage taken. Recipes and blueprints can be found all over the place, and sometimes simply experimenting yields results. You’ll eventually come across zombie soldiers in helmets and bullet vests, which you can loot and reinforce with pieces of flint or old steel plates. It’s a robust system that counterbalances the fairly shallow skill tree to ensure that you’re always striving to stay armed and armoured and fully stocked with curatives and ammo. Unfortunately, your inventory is tiny, forcing you to think about everything you pick up – especially as ammo and food take up the same slots as crafting materials, weapons and quest-specific items. As night falls, the more aggressive inhabitants come out to play, and they can only be held back by light. Your flashlight is your best friend, and you’re only safe from them near a campfire – which you find all over the place and can be lit to cook food and provide light. 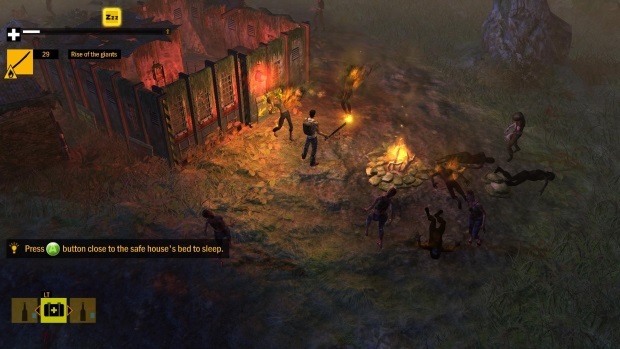 You’re only safe in designated bunkers that you can lock and sleep in, but they’ll need cleaning of zombies first – and every one of these events is a challenge comparable to Left 4 Dead’s “crescendo moments”. You kill everything that comes near you until the light goes green and the siren stops wailing, and then you close the door and get some rest. 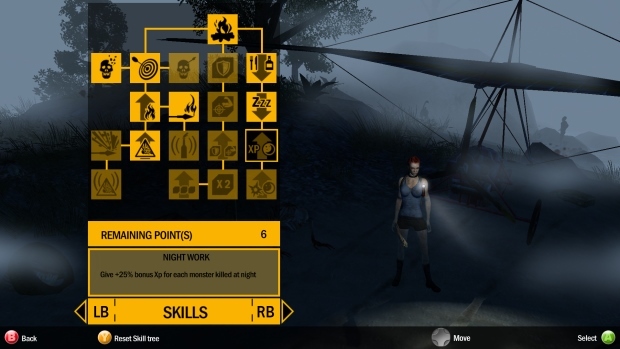 Other survivors provide quests and aid here and there, though the most notable NPC is Kovac, a Russian survivalist who’s How to Survive guide provides humorous insights and tutorials wherever it’s found. Kovac himself also trains you in some of the basics, and tends to turn up at specific points to lend a hand or offer advice. The biggest issue with How to Survive is that there isn’t much variety. The four islands all appear to be fairly identical, and the missions are almost all fetch quests of some kind or another. Enemy types range from standard zombies to huge Tank-like brutes and explosive “fatties” or “Bombers”. Some have helmets on or body armour, and the undead animals (dear and boar, predominantly) are tough as nails, but your tactics will rarely differ unless you’ve just unlocked a new weapon or skill. Although the story itself is quite short (around 6 hours, difficulty notwithstanding), there are 8 different challenge maps to play. Usually these plonk you down with nothing and ask that you reach a plane to escape, but each adds specific parameters such as using nothing but a chainsaw or only having exploding fatties to deal with. The challenges are genuinely tough, but just as much fun as the main game and well worth a blast when you’re finished the story. There’s also a multiplayer mode, but it’s almost entirely redundant. Not only does playing with a friend debunk the fear of isolation and the theme of self-reliance, but the characters’ skills don’t really complement one another (they’re all the same, see? ), meaning you gain very little but laughs by going co-op. It is, however, worth teaming up to tackle the granite-hard “Ironman” mode, which will see the weak among you reduced to quivering cry-babies in no time. VERDICT: How to Survive is more fun than it has a right to be. Schlocky voice-acting and ropey, ugly aesthetics can’t get in the way of what is a very addictive little Action-RPG with elements of Dead Island’s crafting system and State of Decay’s resource management. It’s not the deepest, longest or most imaginative of games, but How to Survive’s take on survival horror is quirky, compelling and just on the right side of challenging. Recommended for anyone with a soft spot for the undead.